That's right fine people of the Internet, HoZac Records was requested to curate the BLACKOUT Fest once again and since it had been five long years since the last one, we figured it was worth a shot. No more of the four-six day marathon standing/leaning/drinking/puking all in the same room monotony (where even your favorite bands on earth can sound bland), it's now cooked down to just TWO DAYS of bands, which makes the whole "fest" experience so much more tolerable, and we know you'll agree. 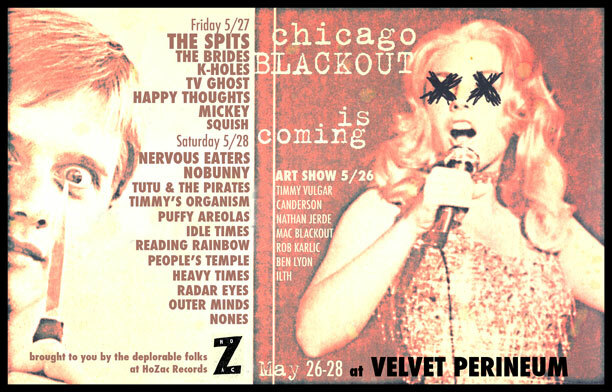 May 27-28th 2011 at Chicago's most sophisticated ballroom, THE VELVET PERINEUM in Logan Square (venue holds 500+). There will be 250 "golden tickets" for discounted Friday/Saturday entry, details below. There will be 250 "golden tickets" for discounted Friday/Saturday entry, then 250 available at the door for each date. TICKETS ON SALE >> HERE! !